You can move a document folder within a project. From the root folder to a subfolder. 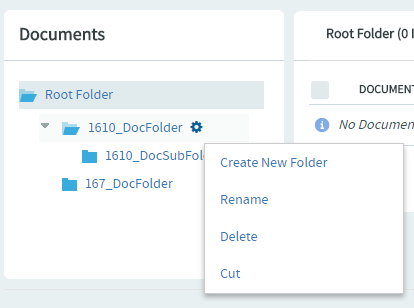 From a subfolder to the root folder. From a subfolder to another subfolder. 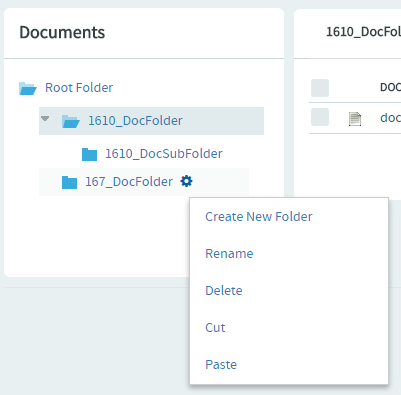 When you move a document folder, any documents and subfolders that it contains are also moved to the destination folder. Project members monitoring the destination folder will continue to receive monitoring notifications after a folder is moved. Project members not monitoring the destination folder will not receive further monitoring notifications. Using the document tree, find and hover your mouse over the folder that you want to move. A settings icon shows up when you hover your mouse over a folder. Click the settings icon and select Cut from the menu. Using the document tree, find and hover your mouse over the folder into which you want to move the selected folder. Note: You can move a folder into the root folder or into any other folder. Click the settings icon and select Paste from the menu. The folder is moved to the destination folder.